Therapy students from Canterbury College spent a day giving free treatments to carers for the latest Pilgrims Hospices pamper day. 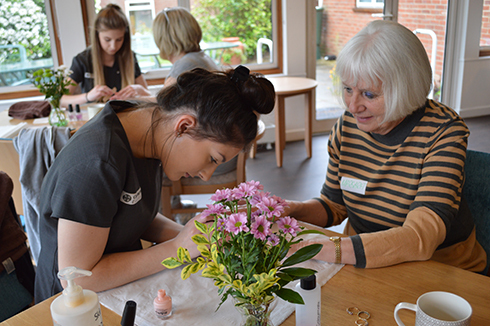 The beauty, catering and hospitality students gave their time so carers could take some time out to relax and enjoy a neck massage, facial or manicure and pedicure and some delicious cakes. Pamper days are a regular part of Pilgrims new Wellbeing and Social programme available from its Therapy Centres in Canterbury, Ashford and Thanet. Each centre offers a range of free services for people who are in the later stage of life limiting illness and their families aimed at enhanceing their wellbeing, in mind and body. The students, aged between 16 and 19, were volunteering as part of a community day to help them to gain more practical experience while giving something back to the local charity. 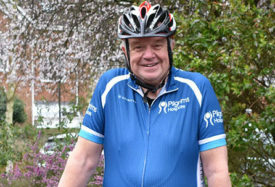 Every day in east Kent, as many as 19 people could receive the news that they have an illness that cannot be cured and that they may have less than a year to live. The Wellbeing and Social Programme is free for anyone in the later stage of life limiting illness and their family. It aims to enhance their wellbeing in mind and body. If you, or someone you know could benefit from this support, the first step is to talk to your GP or healthcare professional. They can advise whether the programme is right for you. More information is available here. 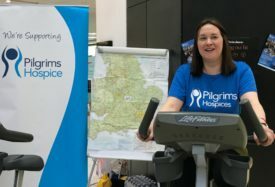 Or contact Pilgrims for more at therapy.centres@pilgrimshospice.org.